Sometimes, when yarn speaks to you about what it wants to be when it grows up, you should listen to it. Or else that yarn could languish in your stash for years and it's quite possible that you'll forget what it had told you what it had wanted to be. So you see, I had no choice but to cast on this yarn. Who am I to hold back an inanimate object's dream? But don't worry. I have vowed to give both the Unikitty socks and this new pair of socks that's also of the plain vanilla recipe variety, equal amounts of love and knitterly attention. Who knows, maybe if I play my cards right I could end up with two new pairs of socks within days of each other. That would definitely give not only my sock knitting mojo a nice little boost, but will also enhance the handmade awesomeness of my sock drawer. A total two-fer. I love it. But I think once I'm finished with these two pairs of socks that maybe I should cast on a pair that isn't in plain vanilla form. I'm sure you guys are getting bored with plain vanilla and really, can a blog exist solely on plain? Hmmm...maybe I should cast on a sweater too to up the interest levels around here. Because who doesn't love a good sweater WIP? Ok. One thing at a time. First, socks. My mission this weekend will be to get at least one sock from each pair completed. I can totally do that. After all, it's Mother's Day on Sunday and I plan to do nothing but eat macarons, knit, and let "my boys" spoil me with gifts (re: the aforementioned macarons) and by doing all the housework. Besides, this new pair of socks already have me completely addicted to knitting on them. The yarn alone is a luxuriously soft and cuddly MCN, and the self-striping stripes consist of, get this: TEN colourful stripes between layers of concrete grey. It's crazy bonkers. In a good way though. 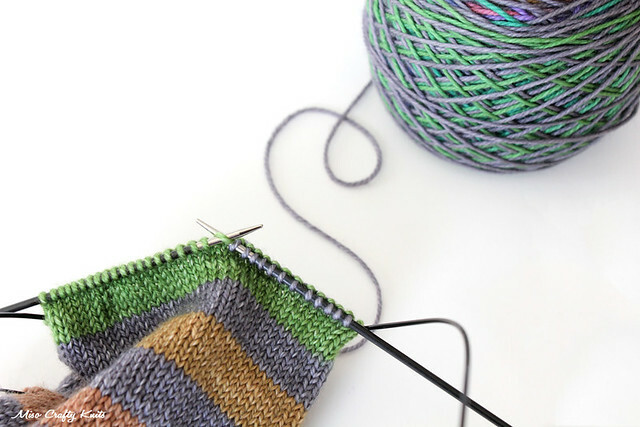 Because you just want to keep knitting and knitting stripe after stripe to see what comes next. It makes me wish I had longer legs. But at the same time, makes me glad I have small feet because then I can finish and wear the socks faster. Silver linings. There's always one when you look for it. How's this for a coincidence... I ordered the exact same yarn last night. I've been waiting for ages for it to come back in stock and lo and behold!! I'm t-h-i-s ----- c-l-o-s-e to paying someone to knit my socks for me. I have so many different self-striping yarns I desperately want to use right now. Haha!! I know what you mean! I have so many skeins that I want knit up pronto, it's not even funny. Times like these I really wish I had one of those CSM to knit all my plain vanilla socks for me. At each knitting event I keep hoping I'd find someone who has brought theirs along for demo purposes. Although, that just might make me want one! You're going to LOVE Concrete and Tulips! I have my eye on a few other of her colourways. Did you just get the one skein or did you also pick up more? There was a woman in the Plucky Rav group who would machine knit socks for $20 and I thought about it. Beautiful yarn! And I saw you won Happy Feet over on through the loops. Congrats! Happy Mother's Day! !